PRODUCT: Black EPDM Rubber Roofing Membrane, NR Non-Reinforced, UL Class-A Fire Rated, 'KLN' Clean (talc free), 60 mil, 10 x 50 Foot Roll. Price/Roll. * Select Freight Shipping option. * Use Freight with Liftgate service if you cannot offload from a truck. * Use Freight Residential unless you located in a Commercially Zoned delivery location. WeatherBond BLACK EPDM is a .060” thick single ply roofing membrane. "Clean" product is without talc on the surface, which makes it easier to clean before adhering. Convenient 50 foot rolls weigh about 208 lbs, so they can be easily loaded to a roof by two people. 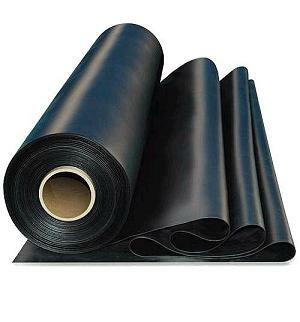 Black EPDM single ply membrane is used in Fully-Adhered Roofing Systems. The substrate and membrane are coated with WeatherBond Bonding Adhesive. The membrane is then rolled into place and brushed down. EPDM Seam Tape and EPDM Primer are applied to the seam areas.